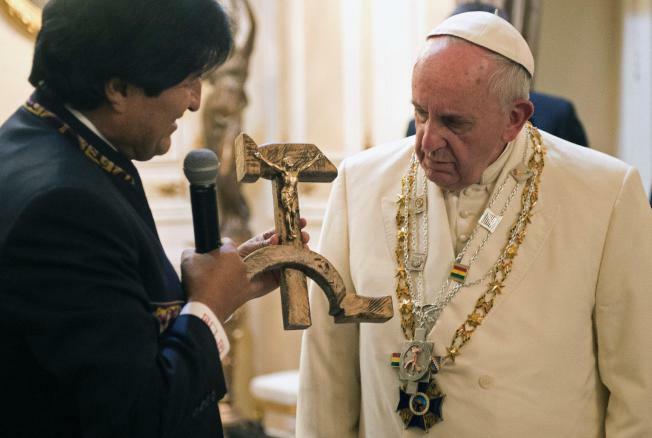 During a formal ceremony, leftist Bolivian president Evo Morales presented Pope Francis with a communist crucifix depicting Jesus nailed to a hammer and sickle. The communist crucifix is a replica, originally designed by Jesuit activist Luis Espinal, who was assassinated in 1980 by suspected Bolivian paramilitaries during the months that preceded a military coup. The night before, Francis stopped at an airport to pray at the site where Espinal’s body was found. “Dear sisters and brothers. I stopped here to greet you and above all to remember. To remember a brother, our brother, a victim of interests who did not want him to fight for the freedom of Bolivia,” Francis said. Following a brief examination of the wooden crucifix, Francis handed the gift to one of Morales’ aides. Although spokesmen for the Bolivian government maintained that there was no political motive behind the gift, conservative Catholics claimed that Francis was being manipulated for ideological reasons. Morales also presented Francis with a medal depicting the hammer and sickle in memory of Espinal’s death. Espinal was a Jesuit priest, journalist, and communist agitator. For more on the story, see Vatican bewildered by Bolivia’s ‘communist crucifix’ gift to Pope Francis. The video clip below shows Morales giving Francis several gifts in a formal ceremony. Before Morales gave Francis the communist hammer and sickle crucifix, he presented him with a pectoral cross with the same hammer and sickle image. What most Catholics and self-identified Christians don’t know is that the hierarchy of the Roman Catholic Church has been deeply invested in progressive collectivism for generations. While abhorring atheistic dialectical materialism, the hierarchy has embraced certain elements of Marxist theory including social justice and economic redistribution of wealth and has sided with authoritarian collectivism over personal freedom and individual liberty. Catholic visionaries and commentators such as the late Father Malachi Martin and Kathleen Keating have predicted the rise of an Anti-Pope who would transform the Church’s fundamental teachings and lead the faithful to embrace the Antichrist. Some prophetic scholars say the book of Revelation predicts the rise of a future Antichrist along with the False Prophet who will implement the religion of the Antichrist and cause the masses to worship him as God. This 12:00 youtube video is taken from The Millstone Report web cast at the Resistance Radio Network. The show aired Tuesday, March 27, 2014. TMR is broadcast live M-F from 10:00 am — noon on channel 2. The pope’s critical comments last year about capitalism and his condemnation of “the economy of exclusion and inequality” have energized America’s progressive Catholics. Hussein Obama said he was “hugely impressed” by Francis’s call for the Church to stop its obsession with debating the teachings on abortion, homosexual marriage, and contraception. The truth is Hussein and Francis are on the same page when it comes to wealth redistribution and social transformation. Throughout history the intellectual tradition of Catholicism has been statist and hostile to free markets, property rights, and the separation of Church and State. The problem today is too many evangelicals think the pope is a Christian leader and the Roman Catholic Church is just another Christian denomination. And to make matters worse, the Vatican and Jesuit Order’s involvement in creating the New World Order is never mentioned in the same breath with the International Bankers, the Bilderberg group, the Illuminati, and Freemasons.